Ducky has begun transitioning from Year of the Dog spacebars to Year of the Pig. Your keyboard may contain either one. Featuring PBT double shot seamless keycaps with side laser engraving technique. Smaller size, but no functions sacrificed. Supports Ducky Macro V2.0 and Mouse control function. 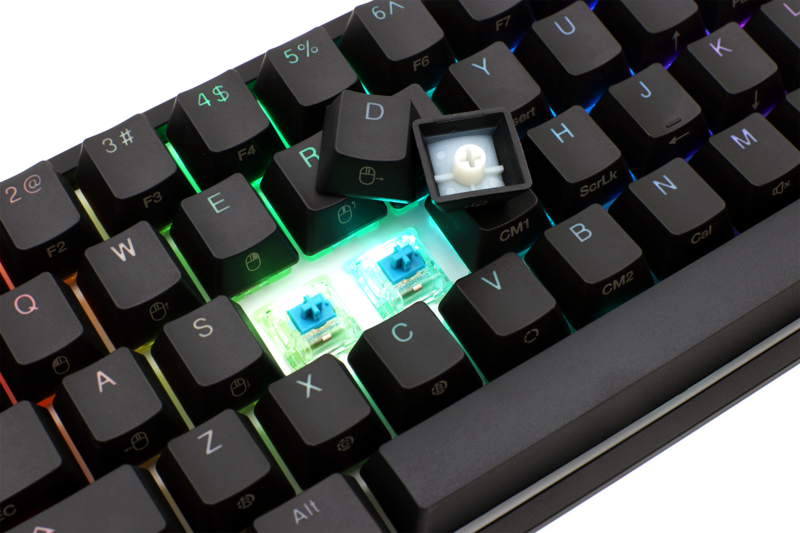 The new bezel design shares a similar sleek frame as it’s predecessor, but the One 2 Mini incorporates dual colors on the bezel to match all varieties of keycap colorways. This keyboard is for you ! I think it's actually the best on the market ! The brown switches are insaaaaanes !!!! French : Je vous conseil a fond ce clavier il est super, surtout avec les switchs marrons qui ne sont pas tres bruyant et qui ont un confort de frappe sublime !! This is by far the best mechanical keyboard on the market right now. It is compact, well built, and the keycaps are magnificent and will not wear down. I know many Twitch streamers use this keyboard and use custom keycaps, but I honestly think that the keycaps on this keyboard are better than most, so there's no need to switch them out. The RGB is bright and vibrant, but if it's too much for your eyes, especially in the dark (the only annoyance that I have experienced thus far), you can easily turn down the brightness using the user's manual/guide included in the package. I totally recommend this keyboard to anybody who is a casual gamer, wannabe streamer, or office typist (if you are the latter make sure to get the red or brown switches, they are quieter for office work). Best Keyboard ever made! Best Price and Best Quality! As far as mech keyboard goes, this is a good keyboard. However, if you use both MacOS and Windows, this keyboard has one super annoying issue. It seems that this keyboard is not detectable by the Mac while booting up, meaning you cannot boot into the Boot Menu or the Target Disk Mode by holding onto the left ALT or T during boot. This works perfectly even on my very old and cheap Logitech Windows keyboard. I'm not sure why this doesn't work with the Ducky. I have to boot into both MacOS and Windows frequently, so it's really annoying not being able to do this easily. The keyboard in itself is really good, good quality, it feels good tu use. But can't you make a dedicated application for managing the rgb and the macros? You need to go through all of your profile to find where you binded a specific macro and cycle through all of the rgb option to find the right one. A bit disappointed about that aspect. Just received my keyboard, it's amazing, now i can click circles without hurting my wrist and waking up my whole neighborhood ! This is by far the best keyboard I've ever owned. I've owned a couple mechanical keyboards but this right here is the best one. It has superb build quality, it sounds amazing, coloring of the keyboard is amazing. No extra software, all the color changing is built in. Absolutely amazing keyboard. I have the Silent Red switches and the material of the key caps makes it feel so satisfying when you type. Best keyboard I've ever used. This keyboard is honestly the best keyboard I've ever used. I have the Silent Red switches and they feel amazing. It's so satisfying to type with this. This is a very high quality keyboard and it looks even better in person. I would recommend this keyboard, especially with the Silent Red switches, to anyone who is looking for a solid gaming/typing keyboard. The RGB lights are a great addition as well. Overall, I give this keyboard a 10/10. This thing is pretty sweet. No issues so far. OK i Have been using this keyboard since yesterday and i am shocked on how good it is. I'm typing with it right now and the sound is wonderful. Gaming with this keyboard is so good because it saves up so much space on your table. The only thing that is wrong is I wanted the year of the dog space bar but i got year of the pig, But that is my fault i ordered it late so yeah. The key caps are good and the other extras (pinkish red) Look good as well. And i ordered it When they were in stock (Brown switches, last Friday) and they got here Monday. Shout out Mk for the great KB!!! Great keyboard, feels nice an solid, cherry red switches feel comfortable for me. Definitely recommend this keyboard 100%. small will fit in almost every table you have. you will have a lot of room because of this keyboard. that is one reason why i bought it. Absolutely amazing keyboard - for the first 3 months or so. After that some of the keys became faulty and it would type twice even though i only pressed them once. This isn't a problem in gaming but more for typing literally anything out. I'm in the process of RMA'ing this so hopefully it gets fixed. Will keep you guys updated if anything changes. From MK: Sorry for the trouble. Please note: the firmware on this product page should fix the issue you're describing. If you've already shipped it out for the RMA, we'll install it for you. If not, you can download it here and it should do the trick. This is the best keyboard I've ever had and I think you should pick one up for yourself! Great keyboard with a tiny foot print. I was worried about "alleviating" myself of all the extra keys for the extra mouse real estate, but it's hardly noticeable when gaming. Free roam of the mouse with all the shooters I play, and no lack of keys to keep up! I don't have the keyboard but my friend does and it is a overall beast and I just love the feel and the RGB I would recommend it to anyone who is looking for a keyboard like this one. The keyboard feels amazing had a bunch of keyboards before this one. This no doubt has the best keystroke, but manufacturing could be better as I touch the side the board creaks. Recommend. Greatest 60% keyboard on the market right now. I ordered on December 10th and got it January 11th. I got silent red switches and it is the best. 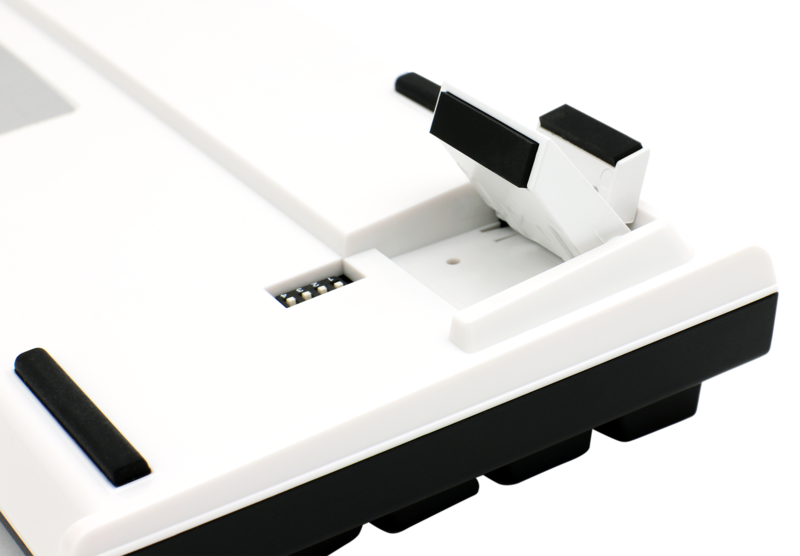 It is capable of doing everything you want that would be on a full sized board, and can even do macros. The quality is amazing on this board and is a huge upgrade. Worth the wait, but waiting for this keyboard to arrive feels like time got slower. Love it. Thanks Ducky. this is one of the best keyboards ever i love it. My board does not squeak when pressed in from the sides. Feels solid. Maybe better with later batches or luck. Update the firmware if you plan on the macros and everything else to work correctly. At first the skip/pause/next track macro was not working (Spotify) before the update. Ordered the Cherry MX Red Version on Feb 13. Arrived March 14th. NA. Noticed there is a weird rustle sound while moving the keyboard from left to right, near the enter cap, unter the caps ofc, Sounds like something lost it hold Inside. This keyboard made me realize what quality really is in a keyboard and I thank ducky and mechanical keyboard for that experience very much. I've used the keyboard before but i wasnt mine. As soon as i hit one key i fell in love with it. But at a local store it was like 300$ and i was sad :( but my friend showed me this site and bam BEST PRICES IN THE WORLD! I love it got it for my birthday and the best keyboard iv'e gotten by far. So, I got the cherry silver switches on my ducky mini and they are just what I was looking for. The silvers are comparable to the red switches but they have a shorter travel distance. This is my first time purchasing from Mechanical Keyboards and I am impressed with the build quality and feel so far, the keycaps are very well made and sound great. If you have ever thought about getting a 60% keyboard, this is the one to start with even though the hidden functions are difficult to figure out in the manual. Other than that though, everything is wonderful, the built-in software for RGB control is super easy to use. Overall I highly recommend this keyboard for anyone needing a compact and stylish gaming or typing keyboard although I recommend the brown switches if you go for typing. Every aspect of this keyboard is amazing, from the build quality to the amount of features it possesses. I am extremely happy with my purchase. The wait time is always unbearable but estimates are given ahead of time and trust me when I say the wait is totally worth it. Great keyboard! I could not be anymore happy with it. 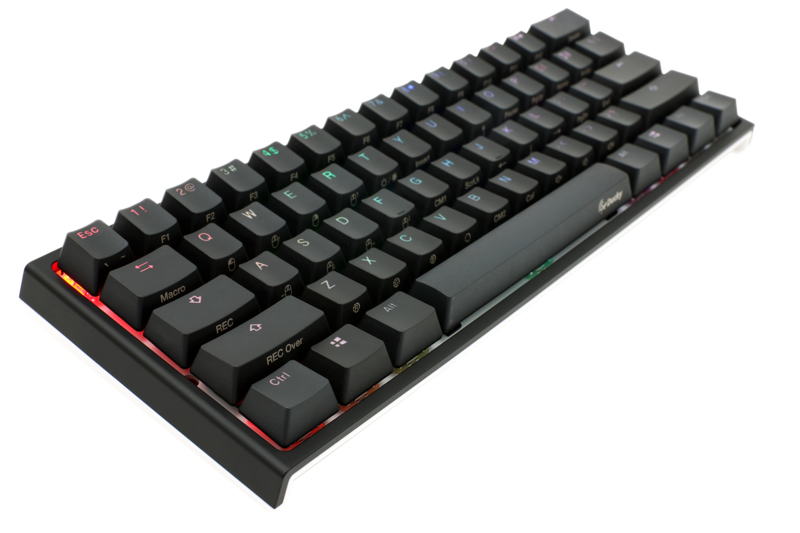 Keyboard is made extremely good and sturdy, And lets talk about the amazing RGB on this keyboard cause its definitely one of the best i have seen. So I want to start by saying that the customer support from mk guys is phenomenal. I know now by actually visiting the shop quite a few times. But for what I can say about the keyboard it is amazing. This is actually the second one that I own, First one being a silent red and boy can I say that i love this keyboard. My second one now is a speed switch for gaming and its just incredible thanks guys !. And also a special thanks to the vet that they have working there that dude helped me the day I went to go get mine. Hes great man thanks again brother hooah! This keyboard is my first and favorite. I have brown switches and these feel very good. The only con though is that the waiting takes forever. Mine took a month and everyday I would check on my order. The ETA can sometimes change so don't be too confident and sure about it. But other than that this keyboard is great. great shipping fast working and hard working good job mechanical keyboards and Ducky, thank you for the free keycaps i hope you guys in the future become the greatest keyboard company as you already are! I bought the keyboard with mx silver (speed) switches and am honestly really happy with it. I had mx silents in my strafe rgb, but I needed more space on my desk, hence the new keyboard. I ordered this keyboard on 2/1/19 and received it 2/25/19. So i mean while it was quite the wait, I would say in my case the wait was worth it. I honestly really like my keyboard, the quality is great imo. the stabilizers are much better than the ones on my strafe rgb, but maybe the one I got was just bad. I am glad I made the switch to the ducky, I can't wait to use it even more. Now let's all be honest here. All of us found out about this keyboard because of Tfue. There is a lot of hype around this keyboard, and now I understand why. I purchased the Ducky One 2 Mini with Cherry MX Speed Silver switches and it is a gorgeous, and simplistic keyboard. Personally, I think Razer products have the best RGB lighting in the market, and the Ducky One 2 Mini rivals that. Beautiful, sleek, and shiny design, with drop dead gorgeous lighting. Amazing Keyboard! Just arrived today and I am very happy with it. So far I have had no problems and I want you to know that this keyboard is a steal for the price of 100 dollars. ORDER IT NOW! it was worth the wait, way more comfortable than a full keyboard. This keyboard is by far my favorite one and will be buying another one for my streaming pc! It is a solid keyboard But mine came broken The usb c plug in was unreachable from the actual port for it. Along with the shipping probably damaging it. 4 out of the 6 screws didn't even come screwed in. I am hoping I do not have a broken plate and that is able to be fixed. Worth the wait, much more comfortable than a full keyboard. Took no time getting used to and the switches are better than expected. Big fan coming from more expensive keyboards. Best thing ive ever bought for myself in awhile. Grab one. Cherry MX SR are the best. I've had the keyboard a few days and it is best keyboard EVER. Plenty of room to flick without hitting my number keypad or arrow keypad. I play R6S (Plat 2) so I had no idea who TFUE was until I saw kids on here saying TFUE sent them. RIP to the real gamers who actually did research and want this keyboard to improve their gaming. It took 46 days to get my keyboard that's why I'm leaving a 4 star review. 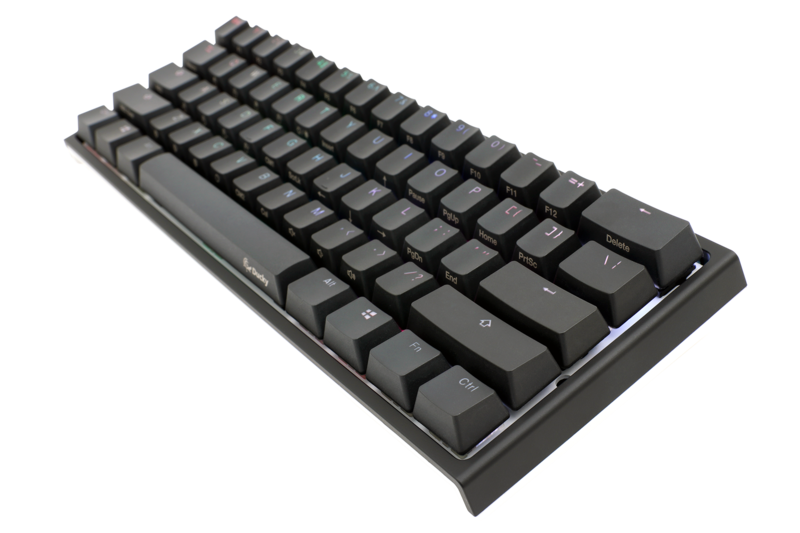 The review is for the Ducky keyboard, it is not a review for MK.com. It is not MK.com fault for the back orders. That being said, I don't want to see anyone else on here complain unless it's been longer than 46 days. GLHF. I would give the Ducky One 2 Mini 5 stars. It is an outstanding keyboard with outstanding performance. I personally got the brown switches. Coming from blues, its a world of a difference. Browns still give an audible click and they are super silent. I have got to say, the space bar and delete key are both AMAZING. They space bar just has a feeling I can't describe, and the delete key is super satisfying. On customer service of Mechanical Keyboards, I would give them a 3. I ordered on January 3rd and got it today on February 14th. The ETA was the 27th, so when I saw that no shipments had arrived on the 27th, I contacted a MK personnel. He said that he would need the order number and order name. I don't have the order number because my cousins bought it for me. A couple of days later I got tired of waiting and emailed again. This MK employee was very helpful. He said that the date had been pushed back to the 7th. I got really tired of waiting and was planning to cancel just as it arrived. Worth the wait? Probably not. Up to you. I already had a fully functional keyboard and I would give that one 3 stars. Great keyboard, love the durability and small form factory of it HOWEVER, mine is defective. As I type this you'll notice how there are double spaces in between every other word. That's because one of the spacebar switches is faulty and needs to be replaced. I contacted customer support in which they are happy to replace it however that means that I will be out of a keyboard doe 2-3 weeks which I no one wants to go through. It's upsetting as it seems like this product was not tested before being shipped out so that says something about the Quality Assurance for this company. I've decided to replace the switch myself as it will take me a day to learn and complete as opposed to 2 to 3 weeks if I were to send it back. Just know that even though these are in extremely high demand this company doesn't seem to do any testing before shipping and you could end up with a defective unit. amazing keyboard recommend to anyone thats a games. Its a must have. Best Keyboard money can buy. Looks great with untraviolet keycaps, and is compact, light and has 8 lighting modes, which you can change by pressing FN Alt T, so really simple. One con is that it would be cool to have software as well to further the ability to change the lighting modes, but I%u2019m in the ducky discord server and that is supposedly coming soon. Overall a great keyboard and definitely recommend, but with some slight annoyances. I love that software isn't required and the ability to customize different profiles and color layers. I wish there were more color layers though. The instructions could be more thorough, for example switching the capslocks key to fn doesn't get rid of capslocks, but this isn't stated in the instructions. ( you can still use capslocks with shift capslocks ). The fact that it has height adjustment feet is great and not some cheap magnetic variant that falls off on movement. At the 100$ price point, I think this has to be the most feature full 60% keyboard. - The creaking of the sides the plastic is very 'bendable' and creaks. - There is no 'sleep mode' for the RGB lights. It would be nice if they would turn off after a set or adjustable amount of time. Also they do not turn off when my PC is turned off. My other mechanical keyboards do turn off. - The USB c cable is pretttttty short in my opinion I had to order a longer one which is extra cost. This is my first "Ducky" keyboard so I hope it'll last reading some other reviews, it's a little discouraging seeing that some of the keys on the keyboard are starting to fail. I hope Ducky has some good customer service if this problem would ever arise. Mechanicalkeyboards has had great shipping service so far I'm definitely going to/and have already order more from them in the future. People who are complaining about shipping and back-ordering need to get a life not really mechanicalkeyboards fault for ducky not being able to produce the demand. Really great keyboard overall, except various keys (especially the S) suffers from extreme key chatter after only 2 months of use. I have the brown switches. Received the keyboard in the mail a week before it's estimated scheduled restock date and it is wonderful. The packaging is so nice. Loving the feel and sound of the keys. Honesty of one of the best 60% keyboards out there. Great keyboard even though I have only have for only a day. The structure and quality of this keyboard is amazing! I got the mx reds and custom keycaps to go along with them and everything is just perfect about it. Great keyboard. 10/10! The brown switches are great. This is one of my first 60% keyboards and I highly recommend it. Pre-order it before you have to wait longer. It's worth it. trust me. This keyboard is perfect! Just order (preorder) it and go about your life for a little bit. Definitely worth the wait! I got mine a few days earlier than they predicted and I couldn't be happier. The keycaps are solid and have a great feel, the red silent switches are so smooth, and the stabilizers feel really nice! I couldn't be happier! Haven't gotten my order yet but I WAS NOT SENT BY TFUE. Reviews look great and I can't wait to try out this keyboard. Although the hardest thing I'm gonna have to get used to is the arrow keys. I got the cherry mx reds amazing keyboard. It took 40 days to get the keyboard but it was worth the wait. I would wait again for the keyboard if I had to. The best keyboard ever. Um. Just buy it. It's literally the best keyboard. My recommendation is Cherry browns good for gaming and typing. I have only had 4 mechanical keyboards before, and this is the best out of all of them. It took a month took ship due to the popular streamer "Tfue" advertising it which I was annoyed by, but it was worth it in the long-run. Wow this board is great I got brown switches and they feel Amazing. My keyboard I used before was Logitech G910 wasn't bad but was big and romer switches you either like or hate. Love how small the board is and the key caps are one of best on the market feel good when typing or gaming. This is a no brainer if your looking for new keyboard. Very sturdy build quality, and the RGB light modes are eye candy to look at. No problems with this keyboard so far, and would definitely recommend for anyone in the market for a 60% keyboard. I was expecting so much out of this keyboard before it arrived and I can say that exceeded my expectations and 100% worth the wait. Mine took a little over 3 weeks to get here for the speed switches but I still couldn't recommend it enough. The only downside is that the RGB lighting isn't completely customizable but it still looks beautiful. So I have had my One 2 Mini for just over a month now, ordering it in October. I had to send it back just before Xmas due to the R key having issues. I got it back just after xmas, and was excited to use it again, only to have issues with 2 more keys now. Overall, its a great board, but having to send it back 2 times already, kinda frustrating. I do hope this can get fixed like the R key, but also hope I dont have issues in just a few more weeks now. So for now, 3 stars, 5 if I can finally enjoy it and not have to deal with paying for shipping to get it fixed this often. I have still not recieved the board after 12 days. I was given the board to see if I like it from a friend and I absolutely loved. I ordered the Cherry MX Blue Switches have seem to be specifically backed up on orders. I would like to know why my order is taking so long. By buying this keyboard with the though that you will become as good as Tfue is absurd. The odds of you ever being near as good as Tfue is little to none. You are causing a shortage in PC peripherals. You are the main reason talented players such as my self and countless others are unable to get the adiquate equipment for streaming or tournaments. I have been following ducky since they released the Ducky Shine 7, one of the best keyboards made by Ducky. Ducky fans and real gaming enthusiasts should be prioritized, not these 10 and 12 year old punks that think having a Mech keyboard will make them better at Fortnite and Minecraft. I wish you all a Merry Christmas and a Happy New Year. We will have to stick together through the Christmas break noobs, memory and GPU shortages and all the other horrors of the modern tech age. Had the keyboard for a few days now and I love it great product from ducky, highly recommend. I bought 3, a silver, silent red and brown. I'm keeping the brown and silver, I really liked the silver, they feel slightly lighter then other silvers I tried, I even modded the springs on a Corsair Rapidfire to be lighter, and this ducky feels great out of the box. By the way, I didnt liked the fact that this tipe of keycaps don't let much light through, so they are average on the RGB department IMHO, I ended up changing all the keys. One thing to keep in mind, this keyboard is great for gaming, you can customize the debounce time to as low as 5ms, which is very good. OK so my first ducky keyboard i bought back in October i gifted to my cousin. I'm trying to buy another one for my self and i see a bunch of tfue fan buying this keyboard because tfue has it. stop taking your moms credit card. TFUE SENT ME HERE. 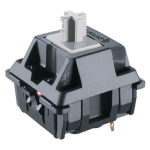 Sliver/speed switches are the BEST! I love this keyboard, the build quality is amazing! I bought the brown switches and they are great! So I got the ducky one 2 mini a few days ago, so far, its a very solid keyboard. I went with the silent red switches and they are very quiet. If your trying to find a compact keyboard for a small desk, its great, my reasoning for docking a star off from 5 is the plastic case, it doesn't feel cheap by any means but an extra effort to make the keyboard more sturdy would be much appreciated. Another complaint I found with this keyboard is keycaps, they feel a little flimsy but nothing too noticeable. Overall a great keyboard for gaming, typing, and coding. Would recommend! This keyboard has been absolutely amazing so far! I am actually typing on it right now and it feels phenomenal. I ordered mine around the beginning of the November when demand for this particular board was starting to get extremely high. Despite a few delays, mechanicalkeyboards.com was able to get it shipped to me as soon as it was available and they were also quick to respond when I inquired about status updates. This was my first 60% keyboard and also my first mechanical keyboard in general so I am blown away at the quality and the form factor. The board feels extremely sturdy and has a surprising amount of weight to it. I got mine with MX brown switches and I am very pleased with my choice due to the low sound profile and tactile feel. 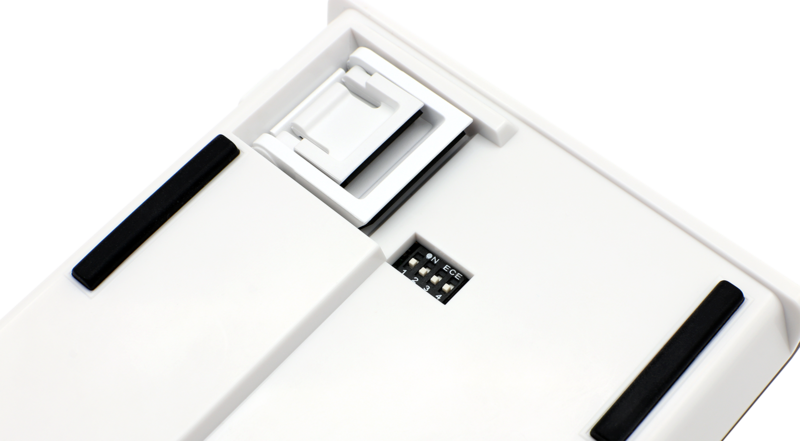 If you are on the fence about getting a 60% keyboard because of the apparent loss of functionality do not be deterred because this keyboard in particular makes it extremely easy to access all function keys and even arrow keys. In the end I would most definitely recommend this board and this website to anyone looking for a mechanical keyboard. Enjoy! Overall very good keyboard and possibly my favorite. Although I did not get a free case and some of the key caps felt like they weren't carefully manufactured. Some of the keys were unusual. Everything else was perfectly fine and awesome keyboard! I bought this keyboard with the silent red option, primarily for gaming and light coding. The keyboard is sturdy, and the key press is smooth with a nice feel at the bottom, the silent reds live up to their name, these switches should not cause problems with roommates or coworkers. I use this keyboard for office work, gaming and travel. Overall weight is good and key strokes feel great, especially with 70A orings (using Brown switches). RGB lighting is nice. Main negative is the plastic case. The bezels have a lot of flex and the sides squeak a good amount. The One 2 TKL is built a lot better but the size of the mini is more appealing to me. This was my first 60% keyboard and I love it. It is much lighter, and more portable than other keyboards. The keys feel great. I got mine in Cherry MX Brown and I really like it. It is silent, and fast. The keyboard came with keycaps, and I also liked them. It came with a year of the dog space bar, and it looks amazing. I learned about this keyboard by watching Tfue's stream, and it was really worth it to buy it. I 100% recommend this to everyone that is interested in buying this keyboard. Great little board, stabs sound decent out of the box, and overall build quality is OK, but I'm docking it 1 star for the all plastic case, it makes it feel a bit cheap. If they had done a metal top like the larger versions it would have been nice. Overall I would recommend it for a persons first 60% if you want to try that size. Not a review, but why I am interested in this keyboard to begin with. I have owned different Ducky keyboards through the past 5 years and am a big fan. I was watching Tfue's stream recently and saw him using this 60% model and just had to try it out. I am also an avid gamer and he is one of the better Fortnite players so why not give it a try! One of the coolest looking boards, and keys and switches feel great. Mixed feelings when it comes to the plastic case. Coming from a pok3r which has a metal case, the thin sides of this board are really pliable and the sides tend to creak at the seams when squeezed. However it is a 1 when it comes to easy transport due to its light weight. Love this keyboard! I came from a Razer TKL with clicky switches to this board with silent reds. I used to think the razer board felt "premium." Boy, was I wrong. From the thick pbt keycaps, the smooth silent reds, to the hefty feel of the whole board, this is the best $100 you can spend on a board IMO. Two features I particularly like are that you can turn dip switch 3 on and use the caps lock as an additional Fn key (caps will still toggle) , as well as change the layout of the right alt, win, fn, and ctrl keys on the bottom right. These features help you to use the Fn layer much more easily. Also, the RGB lighting is beautiful. Buy this board in your favorite switch type! You won't regret it! This is my first mechanical keyboard and I love it. It's so satisfying to type on. I went with blue switches and they work great. The extra keycaps that came in the box offered some nice customization options, and the Year of the Dog space bar looks fantastic. My delete key is sticking just a little bit, but it's nothing detrimental and it may just need to be broken in. Overall the keyboard feels sturdy and is quite heavy despite the plastic body. There's zero deck flex and overall the quality is great. The user manual was easy to navigate and setting up the LED lighting effects was a breeze. The front part of the manual is in Chinese, but the other half is in English and is easy to understand. So far It's amazing. This is my first 60% keyboard and I love it. Only thing is that I noticed I reach for the delete and arrow keys still, which aren't there. But the keyboard makes up for it by using the default macros and you can set up your own so that's a real plus. All in all best keyboard I've had. This is my favorite keyboard I've ever owned. I love the 60% form factor. The RGB is awesome. The build quality and looks are awesome. And after owning reds and blues, I think that brown is my favorite MX cherry switch of all time. One thing to consider that I hadn't: you have no arrow keys. As a programmer, I noticed this almost immediately. If you are using this for work (and not just for gaming), you will need to get used to some macros. That said, I'm extremely satisfied. Of the 3 mechanical keyboards I've owned, this is by far the best. Awesome keyboard! My first 60% keyboard and it does not disappoint. Just have to get used to the new switches i ordered and smaller layout. Tons of extra keycaps as well!